From smartphones to cloud networks, it’s not surprising that 63 percent of business enterprises consider mobility the most significant factor in gaining competitive business advantage, according to Mobile Business Insights. And with the global enterprise mobility market estimated to bring in $240 billion in revenue in 2020, companies can’t afford to ignore the mobile arena. Yet new technology and a vast, rapidly expanding digital sphere carry complicated concerns and dangers. Here are three key factors to consider when developing an enterprise mobility strategy. 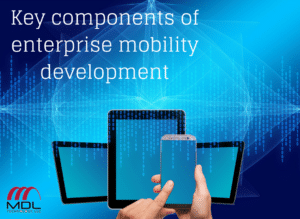 The most recent iteration of enterprise mobility development has seen an explosion in the use of mobile applications — particularly enterprise-specific, cross-platform apps. These apps, tailored to a company’s unique needs and tactics, create a more efficient workflow without features unnecessary to a particular company. Cross-platform apps, which work across multiple different devices, support increasingly popular BYOD (bring your own device) policies and help make work more convenient and accessible for employees. Though mobile technology and BYOD policies allow increased flexibility, efficiency and reach for businesses, they also open the door to serious cybersecurity concerns. According to Security Intelligence, mobile device management (MDM) software is a vital component in implementing mobile enterprise technology, aiding in installation, configuration, device tracking, file protection and more. In addition, a clear data use policy, and possibly training, for employees is a smart move. Hybrid cloud technology, which combines the mobility of cloud technology with the reliability of on-premises hosting, is also a good option for securing data. In fact, 85 percent of companies utilize multi-cloud strategies to manage their data. A fairly recent arrival in the arena, artificial intelligence (AI) is quickly gaining ground as an essential element of effective mobility. In a 2017 Economist Intelligence Unit report, 75 percent of executives surveyed stated that AI would be implemented in their companies in the next three years. Automated technology aids in decision making, efficiency and even sales and customer service by streamlining and optimizing procedures. For more information and assistance with developing enterprise mobility and security, visit MDL’s website.